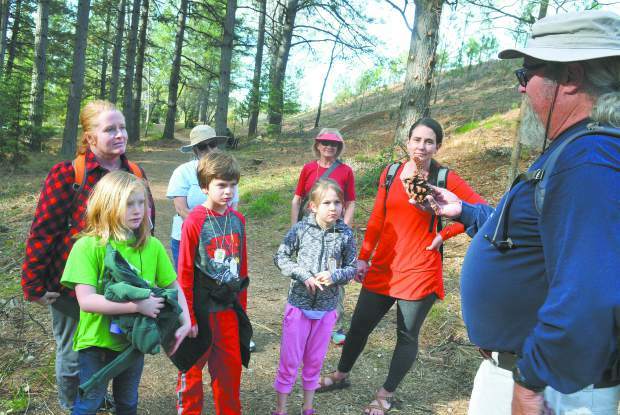 Members of Saturday's junior conservationist inspect different kinds of pine cones during a hike along Grass Valley's Litton Trail. From left, Kristen Adams, McKinley Adams, Harrison Adams, Katie Roddy, CC Neiser, Linda Conklin, Celeste Neiser, and naturalist/storyteller Steve Roddy. 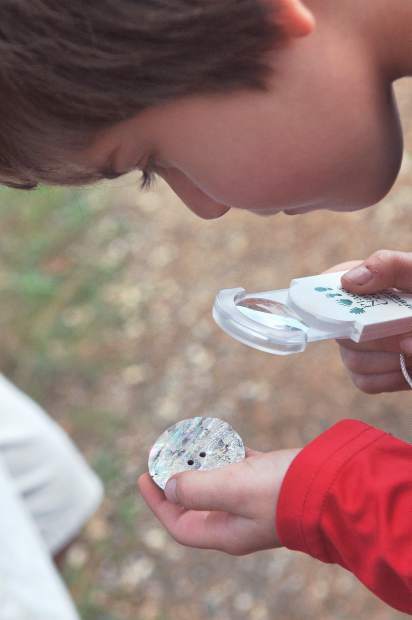 Harrison Adams uses a magnifying glass to inspect the sheen of an abalone shell shown to represent what the native people's of the area used in the region, during Saturday's junior conservationist hike along Grass Valley's Litton Trail. 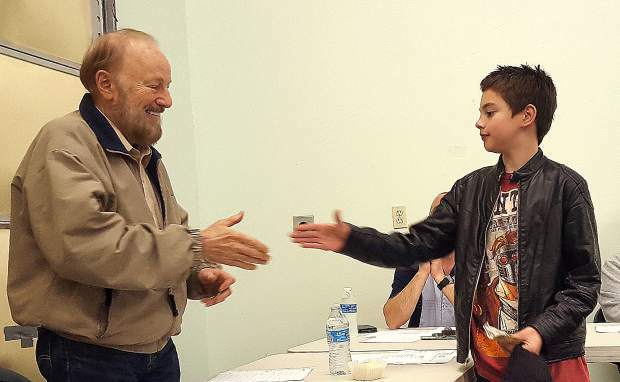 A young conservationist proudly shows off a collection of items that she learned about during Saturdays junior conservationist hike along the Litton Trial. 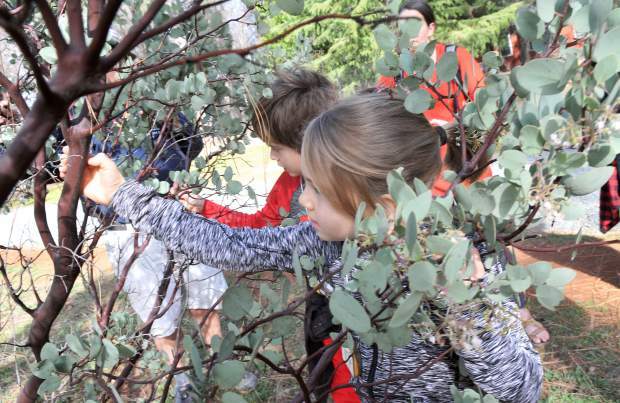 Youngsters Cecilia Neiser and Harrison Adams discover the smoothness of the manzanita's bark during Saturday's junior conservationist hike along the Litton Trail in Grass Valley. 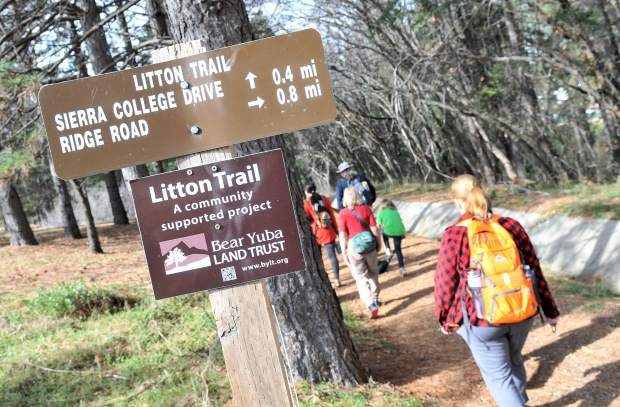 Hikers take to the Litton Trail in Grass Valley during Saturday's junior conservationist hike sponsored by the Bear Yuba Land Trust. 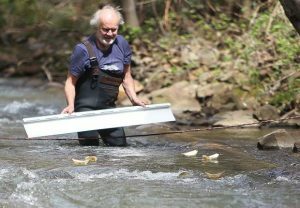 Naturalist, storyteller, and former teacher Steve Roddy points out interesting facts about the plants and animals visible during Saturday's junior conservationist hike along the Litton Trail. 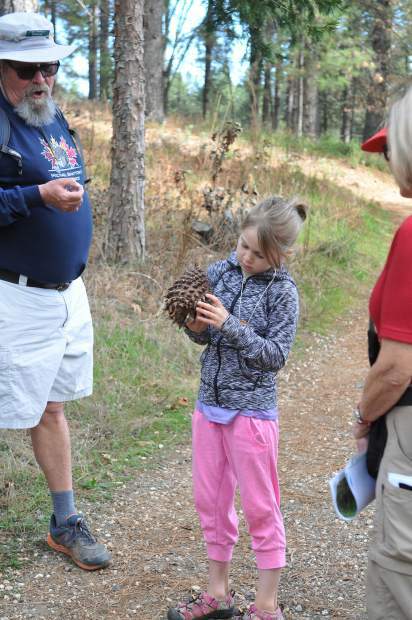 McKinley Adams gets a close look at one of the pinecones discussed along the Litton Trail during Saturday's junior conservationist hike. 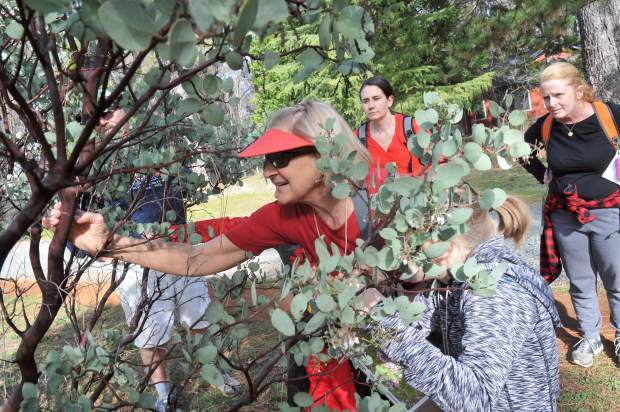 Linda Conklin shows the youngsters some of the many uses of the manzanita plant during Saturday's junior conservationist hike along the Litton Trial in Grass Valley. 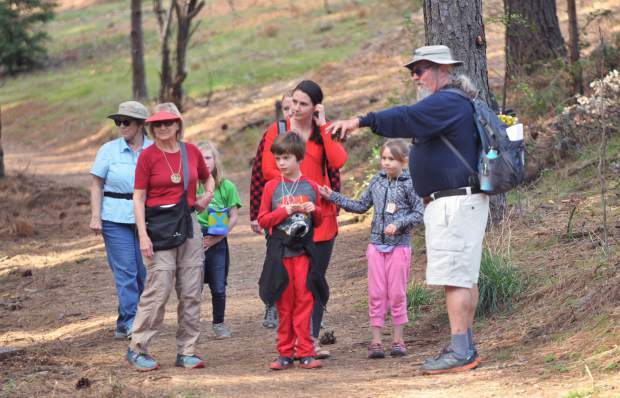 Naturalist, storyteller, and former teacher Steve Roddy paints a picture of how Grass Valley and Nevada City used to be in the days of old during Saturday's junior conservationist hike along the Litton Trail. 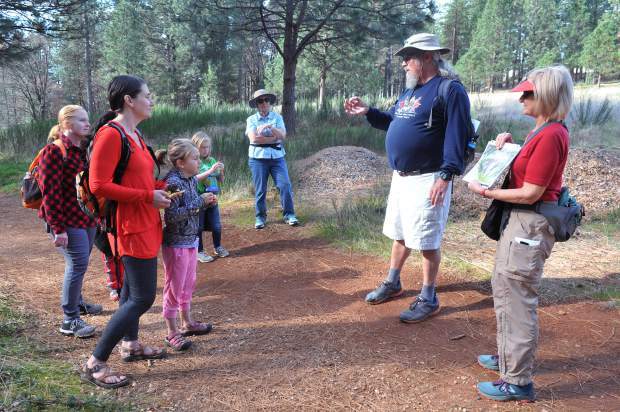 A handful of youngsters and their guardians got a good dose of the outdoors Saturday morning while taking to Grass Valley’s Litton Trail during this month’s junior conservationist hike. Sponsored by the Bear Yuba Land Trust, the hike was led by local naturalist, storyteller, and former teacher Steve Roddy. Along the trail Roddy would stop and explain everything about the natural world around them and even include interesting historical facts. 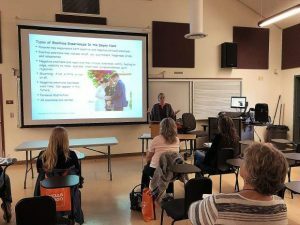 The hikes are geared for youngsters ages 5 to 12 and strive to explore and educate from different area trails on the second Saturday of each month. 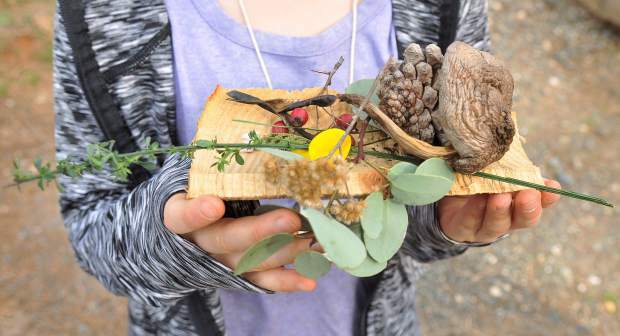 Next month’s junior conservationist hike is scheduled for March 10, at the Burton Homestead outside of Nevada City. 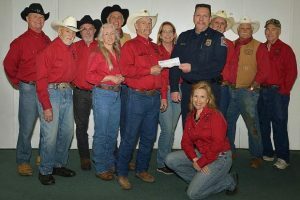 Suggested donation is $10 per family.